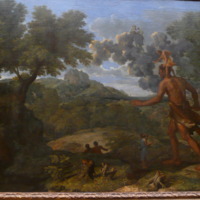 For his depiction of the gigantic hunter, Poussin drew on the Greek writer Lucian (De domo 27–29): "Orion, who is blind, is carrying Cedalion, and the latter, riding on his back, is showing him the way to the sunlight. The rising sun is healing [his] blindness." Poussin also studied a 16th-century commentary on the tale by Natalis Comes which affords a meteorological interpretation. Accordingly he added Diana, standing upon the clouds that wreathe Orion's face, symbol of the power of the moon to gather the earth's vapors and turn them into rain. Toward the end of his life, Poussin scrutinized pebbles, moss, flowers and plants, and his landscapes—such as this one, painted for Michel Passart in 1658—evoke the earth's early history in showing nature abundant and uncultivated. 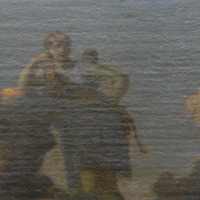 Nicolas Poussin (French, Les Andelys 1594–1665 Rome) , “Blind Orion Searching for the Rising Sun,” Mapping Mythology: A Digital Collection of Classical Mythology in Post-Antique Art, accessed April 22, 2019, http://mappingmythology.com/items/show/85.